NORTH SINAI, Egypt, April 2 — On the eve of Passover, the Jewish holiday that celebrates the story of Moses leading the Israelites through this wilderness out of slavery, Egypt’s chief archaeologist took a bus full of journalists into the North Sinai to showcase his agency’s latest discovery. 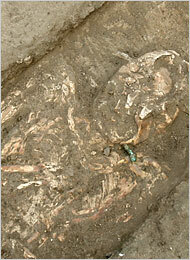 A grave containing a female skeleton near the military fort. Egyptian archaeologists say no evidence has surfaced to confirm the Exodus story. It didn’t look like much — some ancient buried walls of a military fort and a few pieces of volcanic lava. The archaeologist, Dr. Zahi Hawass, often promotes mummies and tombs and pharaonic antiquities that command international attention and high ticket prices. But this bleak landscape, broken only by electZahipHawass excited him because it provided physicpharaonicce of stories told in hieroglyphics. It was proof of accounts from antiquity. That prompted a reporter to ask about the Exodus, and if the new evidence was linked in any way to the story of Passover. The archaeological discoveries roughly coincideantiquity.Thating of the Israelites’ biblical flight from Egypt and the 40 years of wandering the desert in search of the Promised Land. “Really, it’s a myth,” Dr. Hawass said of the story of the Exodus, as he stood at the foot of a wall built during what is called the New Kingdom. Egypt is one of the world’s primary warehouses of ancient hisHawassPeople here joke that wherever you stick a shovel in the ground you find antiquities. When workers builtKingdom.Egypttem in the downtown Cairo neighborhood of Dokki, they accidentally scattered shards of Roman pottery. 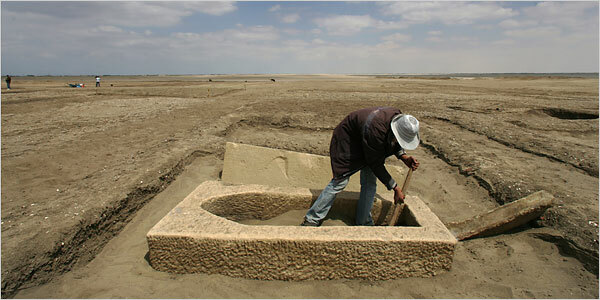 In the middle-class neighborhood of Heliopolis, tombs have been discovered beneath homes. But Egypt is also a spiritualDokkier, where for centuries men have searched for the meaning of life. Sometimes the two converge, and sometimes the archaeological record confirms the history of the faithful. Often it does not, however, as Dr. Hawass said with detached certainty. The story of the Exodus is celebrated as the piHawassmoment in the creation of the Jewish people. As the Bible tells it, Moses was born the son of a Jewish slave, who cast him into the Nile in a basket so the baby could escape being killed by the pharaoh. He was saved by the pharaoh’s daughter, raised in the royal court, discovered his Jewish roots and, with divine help, led the Jewish people to freedom. Moses is said to have ascended Mt. Sinai, wherepharaoh’sared in a burning bush and Moses received the Ten Commandments. In Egypt today, visitors to Mount Sinai are sometimes shown a bush by tour guides and told it is the actual bush that burned before Moses. But archaeologists who have Commandments.Ine never turned up evidence to support the account in the Bible, and there is only one archaeological find that even suggests the JMoses.Butever in Egypt. Books have been written on the topic, but the discussion has, for the most part, remained low-key as the empirically minded have tried not to incite the spiritually minded. “Sometimes as archaeologists we have to say that never happened because there is no historical evidence,” Dr. Hawass said, as he led the journalists across a rutted field of stiff and rocky sand. The site was a two-hour drive from Cairo, over the Mubarak Peace Bridge into the Northern SinHawassa called Qantara East. For nearly 10 years, Egyptian archaeologists have scratched away at the soil here, using day laborers from nearby towns to help unearth bits of history. It is a vastQantarae of nothingness, a flat desert moonscape. Two human skeletons were recently uncovered, their bones positioned besides pottery and Egyptian scarabs. Recently, diggers found evidence of lava from a volcano in the Mediterranean Sea that erupted in 1500 B.C. and is believed to have killed 35,000 people and wiped out villages in Egypt, Palestine and the Arabian Peninsula, officials here said. The same diggers found evidence of a military fort with four rectangular towers, now considered the oldest fort on the Horus military road. But nothing was showing up that might help prove the Old Testament story of Moses and the Israelites fleeing Egypt, or wandering in the desert. Dr. Hawass said he was not surroad.Butgiven the lack of archaeological evidence to date. But even scientists can find room to hold on to beliefs. Then he offered another theory, one that he said he drew from modern Egypt. e Israelites to escape, then closed the waters on the pursuing army. "NORTHShareDiggFacebookNewsvinePermalinkewritePostver, the Jewish holiday" - what's the date for that one, then? I think the cut-n-paste job failed a bit. They can't even agree on where it happened, how does he expect to find proof of it? Also, something that just ocurred for a few moments, would it really leave much (if any) geological evidence? I heard an idea that it was a translation error, and the Red Sea was really the Reed Sea. The Reed Sea was nearby I think, and was shallower. Sometimes the tides would go out so there was a narrow beach that someone could walk across. I'm not sure where I heard that though. I'm pretty sure that it all never happened.